Jon Hammond speaks with me while in town on the weekend of the SF Blues Festival. Jon is a sweet and talented musician with a convincted view supporting artists, unions and collaboration. He is great to speak with, down-to-earth and experienced about the changing world of broadcast. 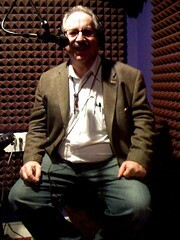 He has done public TV and radio for years and keeps regualr company on both east and west coasts of the US. He has travelled too, and lived in Germany and Paris. This entry was posted in new media, social media, software, technology and tagged hammondcast, jon hammond, jonhammondband, lisa padilla, lisacast, lisapadilla, new media, real-time, realtime. Bookmark the permalink.